The Balaghat mountain range of the Sahyadris cuts across Pune, Nagar and Nashik districts. There are many forts, ghats/passes nested in this range. Malshej ghat, Daryaghat, Naneghat, Sakurdighat, Harishchandragad, Kunjargad, Pabargad, Kallagad, Nimgiri, Hadsar, Bhairavgad are located here. 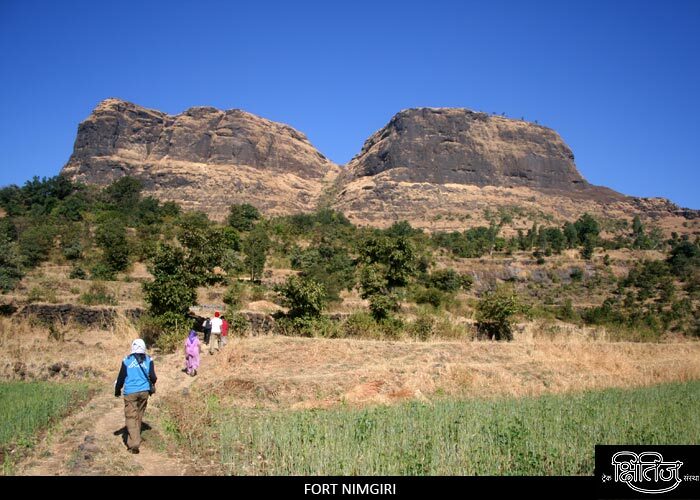 Nimgiri fort is located opposite to Harishchandragad fort and is known for its rock cut stairs. Nimgiri and Hanumantgad forts have been separated by a cleft and it takes about 4 hours to visit both the forts. Nimgiri and Hanumantgad have been separated by a cleft. The ascend to the forts starts from the middle of these two. Keep ascending towards the electric tower which is across the ground of the primary school. As we proceed to the upper level of the tower we come across broken patches of farms. To the left side away from the path we can see a beautiful idol and remains of a temple. There is also a water tank here. Back on the path as we proceed aheadwe come across many idols and Veerghals and some scriptures carved on stones. While ascending the steps we can see a path going to the left where there is a cave built for watch keeping. As this path is broken we cannot access the cave. This cave is visible from Hanumantgad fort. Besides the devastated fort entrance there is a cave for fort keepers. Start the fort trail from the right. We come across 2 water tanks first of which only one tank has potable water in it. There are 2 more water tanks on the route ahead and a temple of Goddess Gajalakshmi and two water tanks with unclean water in front of it. On the upper side of these tanks as we ascend we can see three shrines. Coming back to the tanks and moving ahead we come across 5 caves and the last one has a water tank and a room in it. One of the caves can be used to accommodate 5-6 people. After this start ascending the upper most hill on the fort where there are remains of mansions and houses. The citadel of Harishchandrgaad fort, Chavand fort and Tolarkhind can be seen from here. The temple of Goddess Kalubai which is to the right from the Veerghals can be used for an over-night stay. There are 2 Veerghals behind the temple too. Board a S.T. bus bound for Alephata or Junnar via Kalyan-Murbad. Those coming from Pune have no other option than Junnar. 2 kms after we cross Malshej ghat there is Khubi fata junction and 4 kms further there is Velkhind. At the end of Velkhind there is village called Pargaon. A road to the right from this village goes to Khandipada via Borwadi-Madh villages. This road goes further to Hadsar fort too. Base village Khandipada is 7 kms from Pargaon and can be reached by a private vehicle. Via Junnar one can reach Nimgiri village at 1 km distance and further by walking we can reach Khandipada. Nimgiri and Hanumantgad have been separated by a cleft. The ascend to the forts starts from the middle of these two. Keep ascending towards the electric tower which is across the ground of the primary school. As we move ahead we come across an old tree with an idol of Lord Hanuman below it and 42 Veerghals kept in a line besides it. Ascending towards the cleft for half an hour we can see caves in the hill to the right. Rock cut steps start from here. These steps are broken in some places which makes the ascend difficult. It is advised to carry a rope. A route below this which has many turns goes in the cleft between Nimgiri and Hanumantgad in 15 minutes. To the left of the cleft is Hanumantgad and Nimgiri to its right.